If you got to an intersection and you didn’t know the way, but turned North and I said, “Don’t go that way!” and reprimanded you for it, would you know the way? You would know North is not the way, but you wouldn’t know if you should go East, West, or South. We often do this to our children, except they don’t usually have the benefit of only four choices to deduce from. 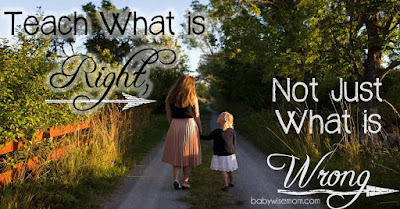 On Becoming Childwise has a list of moral precepts I wanted to discuss. The first is on page 77. 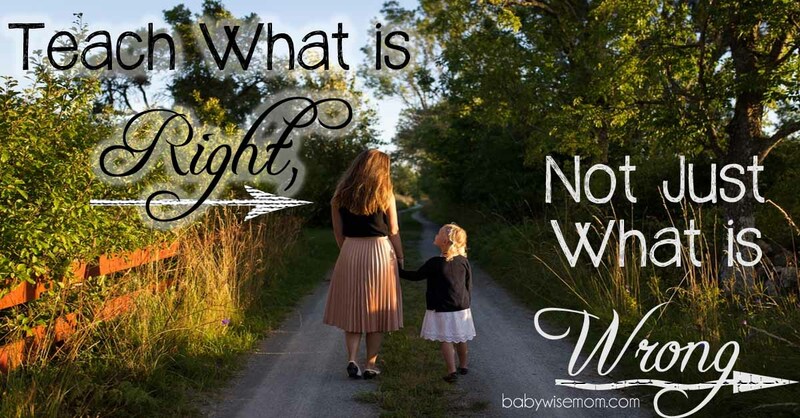 In my own words, it is to “Teach What is Right, Not Just What is Wrong.” A precept is a “general rule intended to regulate behavior or thought” (The Oxford American Dictionary, 2001). An important precept, or rule to regulate behavior or thought, is to teach not just what not to do, but what to do. Teach virtues. You don’t want to spend your days saying “Don’t touch that.” “Don’t go there.” “Don’t take things without asking.” “Don’t talk that way” and so forth. “If all you do is describe bad behavior, then the only thing your child has a mental image of is bad behavior” (page 77). You want to describe the right behavior. I think we sometimes expect a child to just magically know that if they shouldn’t do something a certain way, then they should do it this other way. There is no reason a child should know what she should do if you never tell her. She might be able to figure it out after a a lot of trial and error, but most children will give up before they get there. If all they hear is the negative what “not to do” then they will adopt that negativity. Teaching a child what to do helps prevent that behavior in the future. It gives her something else to focus on. Instead of whining, she has a method you have taught her for how to react when she is disappointed or upset.